The brown Zune has caused much controversy. You either love it or hate it. So the Microsoft Zune is being launched today. Didn't know? Don't care? Well, maybe that's because the music player is launching in the US only, with Microsoft having gone as far as to say it has " no firm plans " for a European launch at all. Throw in the fact that the Zune was designed by Toshiba (and resembles Toshiba's Gigabeat player rather closely), and it's clear that Microsoft is being supremely cautious with its first-generation Zune. Despite all this, the Zune launch is big news, as it marks Microsoft's first attempt at taking on Apple in its own back yard - with the iPod unquestionably the Big Kid in the MP3 schoolyard. So what is the technology industry saying about the Zune and its prospects? The New York Times was one of only two mainstream publications to be sent a Zune ahead of launch, but if Microsoft was hoping this would lead to positive press, it was wrong. A company the size of Microsoft will always be an easy target for criticism, but the Zune gave the Times plenty of ammunition . The newspaper criticised Microsoft's U-turn from its Plays for Sure platform as "a ridiculous duplication of effort", and couldn't understand why the Zune can't be used as an external hard drive, like "just about any other player on earth". It paused for breath to say that the Zune was clearly designed for an older, more business-orientated customer than the typical iPod user: "It can't touch the iPod's looks or coolness, but it's certainly more practical." But it then went back on the attack, criticising the Zune's much-vaunted Wi-Fi capability for only working with other Zunes. "Who'd build a Wi-Fi device that can't connect to a wireless network - to sync with your PC, for example?" The final analysis? "It may be quite a while before brown is the new white." 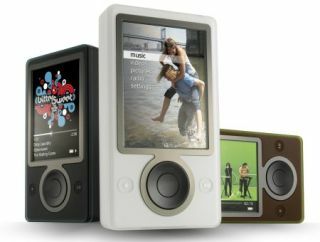 In its preview , Business Week suggested that Plays for Sure's lack of reliability was behind the decision to move in a different direction with the Zune. "Because a variety of digital music devices supported Plays for Sure, using the technology was not always seamless and had its share of glitches," it reported. In an opinion piece, MacObserver.com was surprisingly cautious in writing off the Zune: "There is more going on here than simply assuming that Microsoft has no taste and that they are all design 'doofuses'." It argued that the first-generation Zune was simply a means to an end, and that it was the Zune Marketplace that would spearhead Microsoft's attempts to take on the dominance of iPod / iTunes. In this regard, Microsoft's relative strength in the corporate sector would give it an advantage over Apple. Business Week agreed, citing as evidence Microsoft's recent deal to give Universal Music Group $1 for each Zune sold in exchange for rights to distribute Universal content. "While the seemingly generous move may have been influenced by Microsoft's weaker position in the space relative to Apple, it was also a strategic play by Microsoft to give content providers a stake in Zune's success," it said. The general consensus on the Zune as an MP3 player is that it's nowhere near as good as the iPod. But throw in the might of Microsoft and there aren't too many industry insiders willing to state that the Zune / Zune Marketplace combo are sure to fail. Not surprisingly, web forums are largely divided along company allegiance lines. Apple enthusiasts slate the Zune as being too big, too ugly and too expensive to succeed. Microsoft fans say the iPod's time is up, that brown is cool, and that Zune Marketplace will break iTunes' strict 99c-per-download monopoly in favour of a more flexible monthly contract system. Of course, like we said at the start, it doesn't matter too much to non US residents as the Zune isn't coming to the UK. Not yet, at any rate. And given the widespread criticisms of the player, it may be just as well. One thing you can be sure of - when Microsoft does decide to bring the Zune to these shores, the version we'll see can only be better than what's being launched today in the US.